Today followed much the same pattern as yesterday with everything being a bit better. 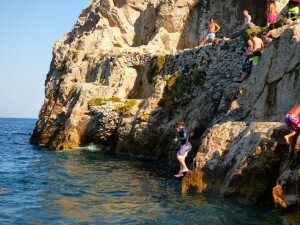 And cliff jumping. In the morning with visited Oia which is a more beautiful version of Fira. All the famous Santorini pictures come from Oia. In the afternoon we went to Kamari Beach. The water was still and perfectly clear and the beach has cliffs at the edge from which people, including Cal and Dec, jumped. It really was stunning and exactly what we’d thought of when planning for visiting a Greek Island. We had dinner in the square of Megalorchi under a bell-tower with six bells and to a background of bazouki music. And all was good.